Bloating is a feeling of tightness or fullness in the abdomen, and many people experience it right after eating, although some can experience a gradual distension of the abdomen throughout the course of the day. Naturally, the diet has a huge effect on the amount of bloating, so by making a few dietary changes, it is possible to switch to an anti-bloating diet. Read on to discover how to seamlessly switch to such a diet as a way to treat bloating and gas. Salt draw water out of the cells, and this can lead the body to retain water, one of the main causes of bloating. If you eat a lot of salty, processed food, then you are making yourself more susceptible to this problem. In addition, adding salt to cooking can increase your intake by more than you might think. The best way to begin an anti-bloating diet is to gradually cut down on the amount of salt you consume. This can be done by using herbs instead of salt as seasoning and eating more whole foods in the stead of processed or junk meals. The breakdown of sugar can lead to the production of gas, so a diet high in sugar means that more gases are created and can find it hard to escape. Therefore, as well as reducing the amount of salt you consume, it is also wise to cut back on sugary snacks or to refrain from adding sugar to teas or coffees. Natural sugars in fruits are preferable to refined sugars when it comes to an anti-bloating diet. The carbonated gases in fizzy drinks can lead to immediate bloating because the gases can find it hard to escape. Therefore, it is best to opt for flat drinks instead of the carbonated ones. Sodas in particular need to be shunned if possible, because they contain both gases and sugar. However, even healthier fizzy options, like carbonated water and fizzy wine, can cause trapped gas and bloating. These do not necessarily have to be completely avoided, but it might be worth cutting down slightly on consumption and replacing them with other healthy vegetable options. For bloating during menopause, adding some phytoestrogens would be recommended. Keeping a record of your meals and when you experience bloating can help you determine which foods may be triggering it. An anti-bloating diet is relatively easy to maintain, as it just involves avoiding certain things and gradually making incremental changes. In order to keep this diet sustainable, try making the changes slowly so that they become good habits for bloating, and the new diet won't become a chore. Bloating can be very uncomfortable. Read on about bloating during menopause. 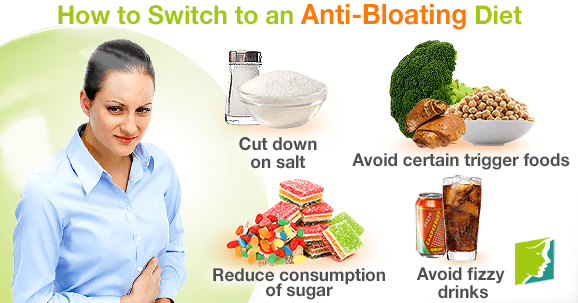 Stomach bloating after eating can be distressing and irritating. Read on to learn more about what causes it. Bloating is a problem for many women, especially as they approach menopause, but it's shrouded in misconception. Learn more here.